Learn about what prenatal tests look for, how they are conducted and what their results may mean for you and your baby. A healthy baby is every expectant mom's No. 1 priority. The good news? Most babies are born healthy. 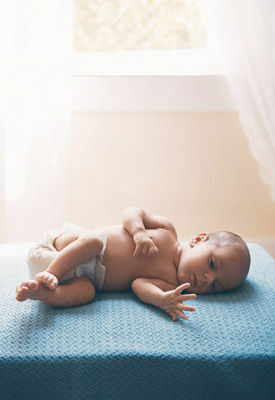 But a small amount (about 2 percent to 4 percent) are affected by some kind of a serious birth defect. There are a number of tests that can check on your baby's health when you're pregnant: Screening tests give parents-to-be an idea of the likelihood that their baby has certain kinds of problems, one such test has been in the news lately. Typically, though, when a screening test shows a potential problem, your provider will suggest diagnostic testing to learn more. Diagnostic tests are performed on genetic material from the baby to determine whether he or she has a birth defect. Here, the most common prenatal tests, and what the results could mean. What does it test for? Chromosomal abnormalities, such as trisomy 21, trisomy 18, trisomy 13, and single gene disorders, such as cystic fibrosis. Is there a risk? Yes, but it's low: CVS carries a less than 1 in 300 to 500 risk of miscarriage. What does it test for? Increased risk for chromosomal abnormalities, such as trisomy 21, trisomy 18 and trisomy 13, as well as cardiac defects. How is it given? First-trimester screening combines the results of blood tests and the findings of an ultrasound. Babies with chromosomal abnormalities, such as trisomy 21 (Down syndrome), can have increased fluid beneath the skin on the back of their neck, and the blood of women carrying babies with Down syndrome can have lower-than-usual levels of pregnancy-associated plasma protein A (PAPP-A) and higher-than-usual levels of human chorionic gonadotropin (hCG). Using ultrasound, your provider can measure the thickness of the fluid beneath the skin at the back of your baby's neck; this measurement is called the nuchal translucency (NT). Using a computer program, your provider will combine the NT measurement with the results of a blood test and your age. The result is then given as a fraction; 1 in 1,000 would mean that your baby has a 1 in 1,000 chance of being born with one of the conditions that the test looks for. What does it test for? Increased risk for chromosomal abnormalities, such as trisomy 21, trisomy 18 and trisomy 13, and neural-tube defects. How is it given? To do a multiple marker screen, your provider takes a blood sample that looks at the levels of three (triple screen) or four (quad screen) substances in your blood which, if higher or lower than expected, can be signs of a birth defect, such as Down syndrome, trisomy 18, or a neural-tube defect. The blood sample goes to a laboratory, where levels of up to the following four substances can be measured: alpha-fetoprotein (AFP) (a protein made in the baby's liver); estriol (a type of estrogen); human chorionic gonadotropin (a protein made by the placenta); inhibin A (a hormone). Based on the levels of these substances in your blood, the test will calculate the risk that your baby has Down syndrome, trisomy 18 or a neural-tube defect. How is it given? To perform an amniocentesis, using ultrasound as a guide, the provider inserts a needle through the mother's belly and uterus into the amniotic sac. (Some of your baby's skin cells slough off into your amniotic fluid, and these cells contain your baby's chromosomes and genes, which can be tested.) The provider then takes a small sample of amniotic fluid and sends it to a laboratory for analysis. Is there a risk? Yes. The risk of miscarriage is less than 1 in 300 to 500— the same as CVS. How is the test given? This test combines first- trimester screening and quad screening, and can pick up 90 to 95 percent of cases of Down syndrome. The results of first-trimester screening and quad screening are analyzed together by a computer program and made available to parents after the quad screen is done at 15 weeks to 20 weeks pregnant. What does it test for? Neural-tube defects and other anatomical defects in the brain, heart and abdominal wall. How is the test given? An ultrasound is performed by placing the transducer (or wand) on your belly. An anatomy scan looks at the entire anatomy of the baby and can reveal visual evidence of neural-tube defects and other anatomical defects in the brain, heart and abdominal wall. Is there a risk? No. Because prenatal tests seek information about your health and that of your baby-to-be, such testing can be very stressful. Getting worrisome results can cause anxiety at a time when you would prefer to be celebrating your pregnancy. Look for support from your obstetrician, a genetic counselor or a social worker with experience helping parents of high-risk babies, as well as the March of Dimes. These resources can help you find as much information as you need about your baby's condition as well as support groups that might allow you to meet with families in situations similar to yours.